A school year (about 180 days) is divided into 3 terms (each with 60 days, or 3 months). Here is our calendar (3 terms). Each class will be taught by a GT instructor. Parents will receive weekly feedback/update about the student. Math: problem solving and raven (space/diagram logic), integrated with math count, math kangaroo, and math Olympia. 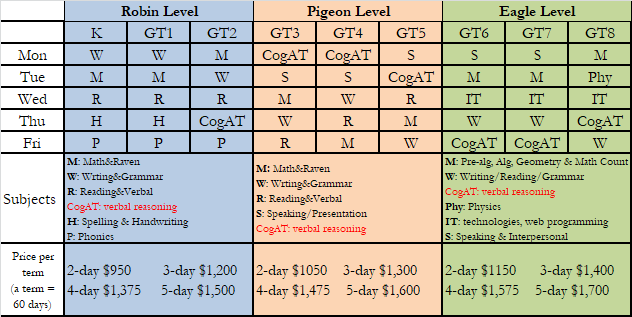 CogAT: verbal reasoning good for MAP R and PARC tests as well. Our After-school program stands strongly behind the students' high performance in the state-wise MAP Test (Measures of Academic Progress).